Man, I had a pretty fortuitous weekend! I went out and hit a couple Walmarts, Five Belows, Walgreens and Gamestops - and came home happy, only to find my set of Super 7 Masters of the Universe Classics figures waiting for me! I so rarely find new stuff and stuff that I end up thoroughly enjoying so this particular haul is quite joyous because there is some really, really great stuff in here! Well, damn - this figure is pretty great! 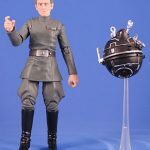 Tarkin a favorite character of mine so I've been awaiting his addition to the 6" line and it's a pretty good thing that they waited until this new face-printing paint technology was in play because the likeness is amazing! In hand. It looks "okay" photos I've seen, mind included, but in person it's remarkably spot-on! I think the head is a bit wider than Cushing's, which throws things off in the two-dimensional world of photography. The body is really nicely sculpted with a very subtle texturing on the clothes. His proportions do seem a little off to me, but I think that's part of the pre-planned reuseablity of the sculpt. Similarly, it's annoying that his right hand has "trigger finger." I would have really appreciated a "pointing" hand or even another "closed" or even "fist" hand instead of this gun-wielding one. In lieu of a gun he comes with the interrogation droid, which is a nice sculpt and well painted but it seems a bit too large. 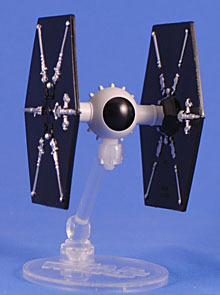 It comes on a stand and is connected via ball-and-socket joint so there is a bit of poseability to it. Also, I've found his feet and legs a bit tough to work with in terms of a good standing pose. Still though, the sculpt and particularly the likeness are great! So much so I'm mildly tempted to get a second one (if I ever see him again!) for my Rogue One collection. Ugh... Hasbro strikes again with yet another frustrating multi-pack. Four figures - two are new, one is a repaint and one overly present in the line. Two are army-builders, warranting multiple purchases, while two are individual characters. We'll start with the worst which is Rey (Crait Defense), who is 100% identical to the "Rey (Jedi Training)" release on a single card and in a two-pack - so glad to be forced to have a second of this super boring, slightly different costume. Moving up the ladder is the repainted Snowtrooper, who the fine print on the back of the box declares a First Order Walker Driver. Whatevs. I'm pretty confident this lazy never appeared on screen, so it's pointless here (and if it was on screen, it was so fleeting and/or the coloring was so imperceptible it didn't register). 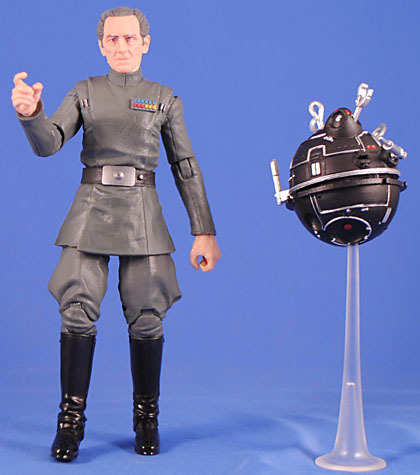 My favorite figure of the set is the all new First Order Gunner - a fairly groovy looking First Order spin on the Gunner helmets from A New Hope. I know the helmet's a little extreme and not for everyone but I dig it; and was surprised and intrigued to see that the box art shows the large "visor" on the front is actually meant to be clear. The highlight of the set is Rose (Crait Defense) since she's the most different from any other figure we already have. She probably reuses the legs from the First Order Disguise Rose and the regular figure's head, but her arms and torso are new - the torso even includes her little backstory necklace, which is a neat touch. The coolest part is that she has a removable poncho, and she looks good with or without. Rose and the Gunner are good figures, and I'd buy multiples of the Gunner if he was single carded and maybe even a second Rose. But as is... this 4-pack is yet another all-too-familiar misfire from Hasbro. I only got it because Gamestop had clearance for 50% off. You might recall that I'm a big fan of the Jakks line of Tsum Tsums, but I rarely write them up since completing the set is a bit of a hassle. Anyway, I was surprised and kind of excited when this was revealed as an exclusive for SDCC 2018, but it was sold-out by the time I made it to the Think Geek booth. Fortunately for me, though, it was actually a Gamestop exclusive and can be found there! It's a decent set, that feels a bit more like they weren't really sure they wanted to do with the Mayor in the regular line, so they sold this off as deluxe set in honor of the film's 25th Anniversary. We get a giant-sized Jack Skellington, just because. He's fine. The mayor is done in the "medium" size, standard for the blind bag series, and for the first time in the line comes with swappable faces (which gives us a neat look into how the Tsums are made). Both the happy and sad faces turned out nicely and one kind of wishes it were more reasonable to display both, but with this set being $15 (the blind bags are $3 - $5) it's a tough pill to swallow in order to double up. The set does include a really nice build of the Mayor's hearse, which he can fit in, and it turned out pretty darn great! It's these bases that really made me fall in love with the line and this is a pretty cool one. It's wheels work, so you can drive your Mayor about to spread the cheer or drear. It came boxed in a surprisingly neat package featuring a stylized Halloween and it even include the Gamestop logo on it (not a sticker) to better boost the sense of exclusivity. This was a neat little surprise to stumble upon at Walgreens. I like how big of a deal Disney has made about it being Mickey's 90th birthday, and this set celebrates both Mickey's first appearance and the reason copyright law is so janked up in America. The set includes both Mickey and Minnie from the short film, done all in black and white. For the "base" is a really nice mini version of the titular steamboat, complete with clear "water" to support it and featuring wheels allowing it to roll along. The cabin of the boat is removable allowing you to easily get one of the Tsums in there. I gotta be honest, this set feels fairly dull once I opened it, and in retrospect I probably wouldn't have got it if I wasn't "high" on finding something I didn't know existed. 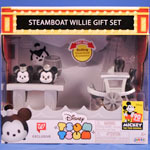 I wish it included a large-sized Pete or that the steamboat was bigger and could fit both figures. This is a Walgreens exclusive (again, I like that the logo is part of the package design and not just a sticker) and cost $12.99 which is about 2.5 times the price of a Tsum Tsum blind bag at Walgreens. It's a novel set but it's just a blind bag release plus an extra figure. So you're just paying a premium for a big, dull package unfortunately. I am crazy for 8-bit style toys - they're just so fun and so interesting compared to the norm of action figures. I've got all of the Nintendo ones so far but then, out of the blue, this giant two-pack showed up at Walgreens as an exclusive. We get a re-release of Mario and a brand new, all-new Bowser! Woo hoo! The Bowser looks very unbalanced so I was sure he wouldn't stand on his own... but he does! Even though the design looks very side-heavy, they 3-D'ed out his shell well enough to bottom-weight him! That's some really good engineering, Jakks - thank you! 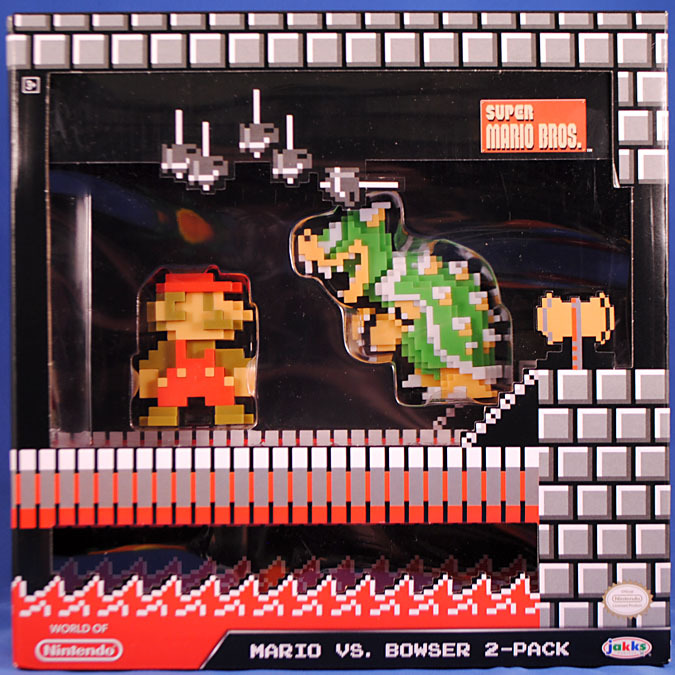 These guys come in an honestly amazing box that perfectly recreates the Bowzer level from the first game! The box graphics are super minimal and really favor being accurate to the game, even the back - which features the "thank you" screen. I was hesitant to even open the set but it's designed to even look just like the level with the tray removed from the outer box! Mario and Bowzer are (very snugly) in a plastic tray on a cardboard bridge suspended over lava. I gotta be honest here... this is the first toy package in a LONG time I'll be keeping - and it'll likely be what I use to display all my 8-bit Mario figures! 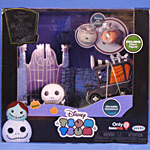 This set's package is twice the size of the TsumTsum one's above but this set retails for the shockingly low $9.99! 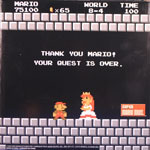 I 100% recommend this - if you get only one 8-bit Mario product, make it this! 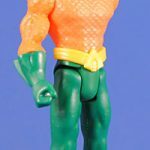 This guy is part of the cheapo 6" DC figure series Mattel has out, and I found him at a Five Below (for the all-too-obvious price of $5). The sculpt is pretty good, given what I'd expect from a line like this, which his arms and chest fully scale-d up. I'm guessing his legs are reused because they don't have his signature fins on the calves, though they are present on the gloves. The head is a surprisingly nice sculpt with the hair being a separately cast piece and, shockingly, the eyes and eyebrows being printed on (like the new Hasbro process)! The orange shirt and yellow belt are slightly metallic plastic and because everything is separately cast pieces (only his neck, eyes, and eyebrows are painted) the colors are really vibrant on him! He has seven points of articulation - the standard five plus swivels at the gloves. This is a pretty rad figure and I kind of can't believe he ONLY cost me $5! I didn't know this new third series of Mega Mini Figs was out so I was pleased to both find it and score the two I wanted. 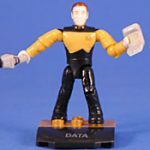 Being a BIG Star Trek fan I of course had to get Data (but suddenly wonder if I ever got Picard and the borg from the first series). It's a pretty good figure considering the tiny size and he even has a fairly good likeness. He does have his eyes/pupils and eyebrows painted on but they are very, very tiny and you have to squint to note them - but they definitely help sell the character. He comes an oversized zed phaser and triocorder, and like the previous series' three basic bricks to build a base for him with a printed name plate. This time around they even cast the 2x4 plates in character-specific colors, which is neat; and Data gets a good one. 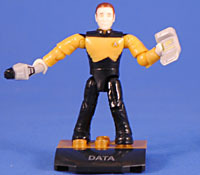 It's a novel little figure, but I still struggle to see how these are actually worth $5 apiece. 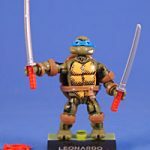 I have most of the MegaBloks cartoon Turtle stuff and was very comfortable putting a pin in that collection - but then they revealed this beautiful sucker. They basically just took the black hashmark paint apps from the black & white Mirage turtles and popped them on full a fully colored figure giving him a very cool, very unique aesthetic! I really like the colors they used for him, the green and yellow are a bit dingy and have a nice "indie comic" feel to them which perfectly compliment the black cross hatching. All the pads and belts are once again cast in rubber, which I get but I'm not crazy about (and the other Leo that store had already had a split belt). Leonardo is MY turtle so that they led with him was the clincher for me, and I absolutely love they they included both a red bandana and a blue one! I prefer my bandanas individual and the blue one looks even more cool with the rest of the aesthetic. Leo also gets his signature dual katana and his base plate is a lime green. I'm definitely looking forward to completing the team in this look (but if it's a one-off, this is exactly the one I'd want!). Holy crap... everything about this new series is just the best thing! 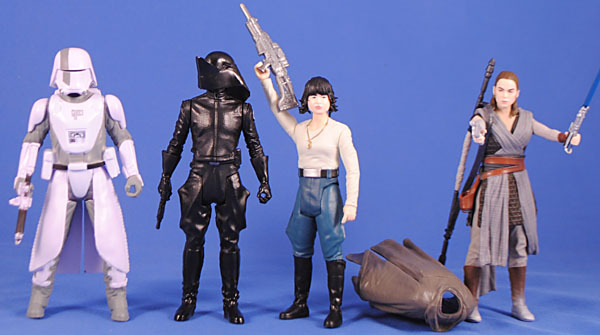 I madly love miniature ship toys and I madly love McQuarrie's art and I have a strong connection to these concept models and i really miss the early-to-mid-2000s, when companies could take a bit of a chance with deep cuts in toylines... and this series combines all of those things! This is, of course, the Millennium Falcon that almost was and is, to the best of my knowledge (and as is the same for the rest of this line), the very first time any physical collectible has been made of it! 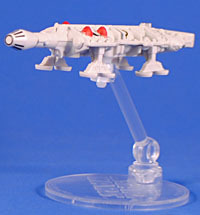 It obviously has a lot in common with the Blockade Runner, which this ultimately became, but still retains the pseudo iconic Falcon elements like flat rectangular engines, a conical cockpit and landing gear. I do wish there was some sculpted windows on the cockpit rather than it just being paint, but it's okay. 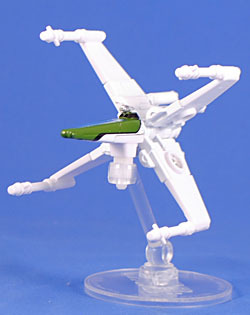 I dig the landing gear and the bright orange escape pods, and that's there's only three left. It's just such a rad, cool toy! This one is kind of a weird choice since model is soooo bland, but I suppose it still has the iconic TIE shape and wings, so it helped fill out the line. This toy gets the model very well, in all it's undetailed glory. The wings are flat with high gloss paint and some minor silver kibble-ing, which does look kinda beat. The cockpit and arms are textureless shapes or no interest, though, and just look cheap... but that is accurate to the original model. This is easily the weakest ship of the five they've shown, but it is an iconic vehicle and I am 110% in for anything like this they make! Now this one is super rad! 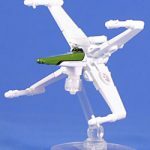 I really love how this original premise of the X-wing was to straight-up arrange the wings in a full, evenly spaced X! It looks a bit strange to my eyes but in a fun way, and Mattel even went ahead and included a pivot shaft down the core of this so the wings are articulated in a way. 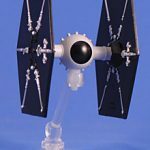 You can "collapse" them a bit to a more movie-version-ish position (though they do seem off kilter to the body/cockpit) or spread to the more iconic wide X. The wings are wing and the nose and body have a nice green color with same black highlights and blue & white stripe down the top. It's just super, super cool - and, man, I just adore these ships so very much! I haven't really bought many, or any, Masters of the Universe Classics figures in ages but when I saw this series at SDCC a year or two ago... I just fell in love. 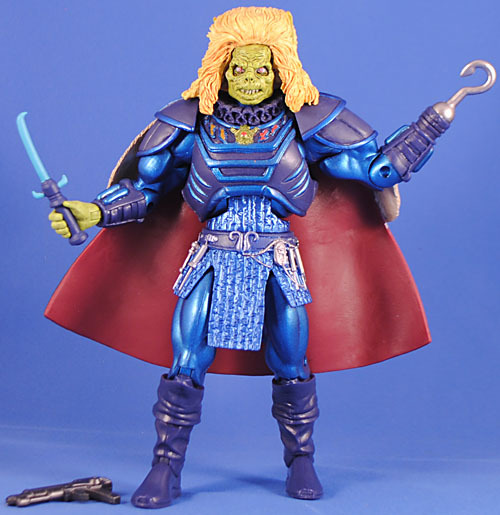 I've never been a big MotU fan but the pure goofy fun of a lot of these figures hooked me on the line and Dylamug is a perfect example of that very thing! He's like a big washing machine with thin limbs, old style diode bulbs on his head and spinning face options. How could I possibly pass on this!? Despite being so gangly the weight distribution and balance on this guy is fantastic. The articulation all works very well and allows for a much wider range of poseability than I expected! The wrists and hands lack articulation which is pretty much the only thing that could improve this guy. 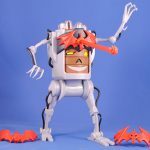 The sculpt is pretty smooth, but apparently this is from the cartoon so given that that has its own line and aesthetic I'm sure this look is fine. He has three swappable Horde logos - toy, cartoon and cartoon-plus-laser blast. It would have been nice if the laser blast one was translucent, but what're ya gonna do? And, of course, his face changes! His nose section is fixed in place, and the eyes and mouth are spinning wheels, each with three expressions (and, nicely, you can kind of double up on the eye expressions by positioning halfway between one of two different expressions). I just loooove this guy. Who's got two thumbs and looks distractingly like Captain Planet...? THIS GAL! 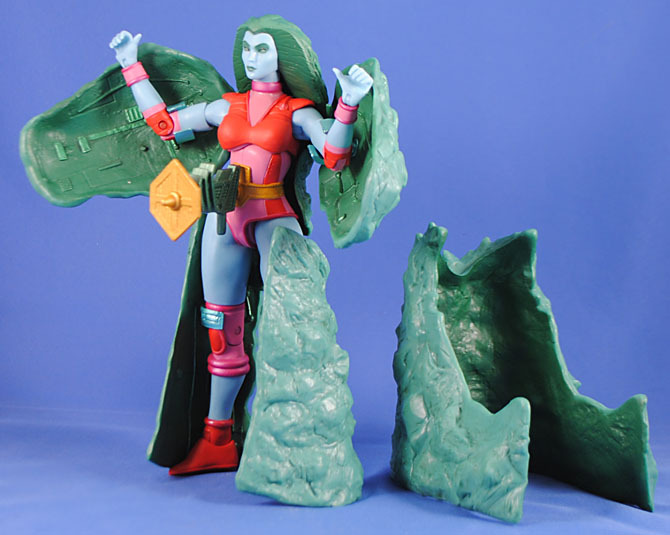 Super7 requires you to order a full set of four figures, which has kept me away from all of their MotU figures so far, but since I loved the other three figures in this and since this lady completes the set with the other rock guy two-pack from a while back... well, she was an acceptable purchase to me. The figure is pretty good and meets all the expectations of the line. Weirdly, her thumbs are sticking straight up like she was Fonzi or something, and means she can't really hold her ray gun very well. But - her gun has a peg on it allowing it to plug into her belt. She, of course, comes with clip-on rock pieces... which are super frustrating. The clips can be very loose so they don't stay in place very well and then getting them properly aligned into the rock form. 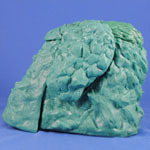 The rock form is neat, but it sure is a pain to build and is awfully fragile once aligned. But, still, she still looks kinda neat and completes a set... so... fair enough! Dear god this such a beautiful figure! Much like Gwildor, the sculpt is remarkably detailed, at least on the head, and the costume is shockingly accurate to the movie, though obviously taller and bulkier to match the base body and general line aestethic. Since the rights to the movie continue to seem a bit muddy, this guy is apparently based on some comic appearance, hence he's blue and green rather than black and white. But the shades and hues are compliment each other gorgeously and the two shades of blue are metallic and reflective... geeze louise this figure is just so unspeakably beautiful!!! He's right up there at the top of my "Toy of the Year" list! Mummys - cool! MotU - cool! Smash 'em up - AWESOME! 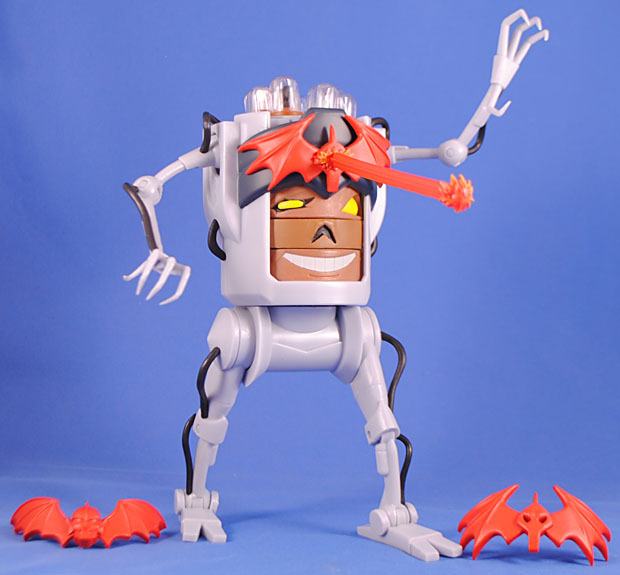 This apparently based on an unmade figure's concept art and HE. IS. EXCELLENT!!! The sculpt is amazing and beautifully detailed and the paint is ggggggggorgeous!!! 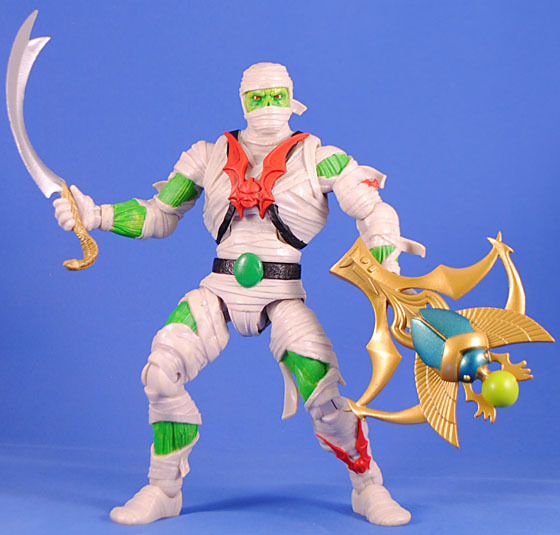 A mummy with neon green skin is just the coolest damn thing! The articulation is all wonderful (though he his lacking bicep swivels, it's still fine, though). 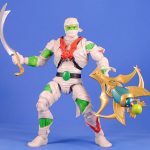 Plus, he comes with a big Egyptian style MotU gun and an utterly, unbelievably excellent scimitar with a cool blade and an amazing cobra snake handle. My god, kids, it's all just so freaking cool! It's just like each figure in this series keeps getting cooler and cooler! 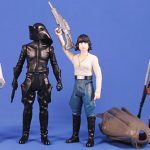 Based on these I can't wait to see where Super7 goes next! This entry was posted in Rustin's Spoils of the Week and tagged Aquaman, MotU, Nightmare Before Christmas, Star Trek, Star Wars, TMNT. Bookmark the permalink. 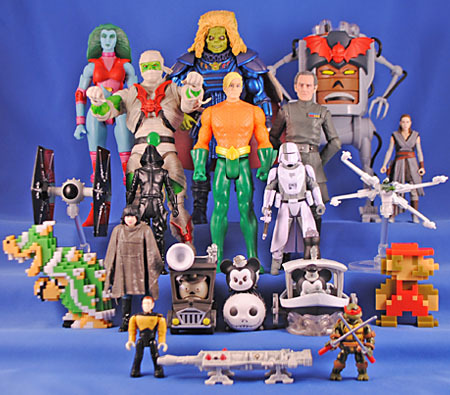 The MOTUC look fantastic. I have them all on order. A buddy of mine received them, just haven't had the chance to pick them up yet! How cool is it that 10+ years in to the line we're still getting awesome new figures! Sure, these aren't A-listers, or even B-listers, but they're still freakin' awesome! Definitely a line for the most fervent fan to support. As long as Super7/Mattel keeps makin' them, I'll most likely keep buyin' 'em.